One-shot comic books—those issues that carry a complete story in typically about 24-30 pages, usually to fill a gap in a publishers current showcase of stories, remind readers of characters of the past, or even introduce a work in its own right with no intention of continuing on in a series—don’t often result in much that is memorable. A book like Batman: The Killing Joke is an example of the best kind, and the recent Green Arrow Incorporated is an example of one that doesn’t stick with you very long after reading. 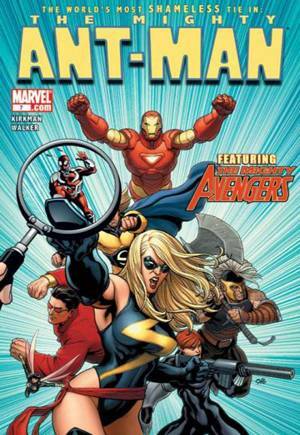 But the new series Avengers Origins has started off right with its volume of expected one-shot issues of more obscure Marvel Comics superheroes, beginning last week with Ant-Man & the Wasp. Like all one-shots, the story must be told quickly and here writer Roberto Aguirre-Sacasa has double-duty with two characters, albeit with an intertwined story. He is pretty successful with Ant-Man and lesser so with the Wasp. But the big takeaway from this issue is the almost dream-state painting style of French artist Stephanie Hans. 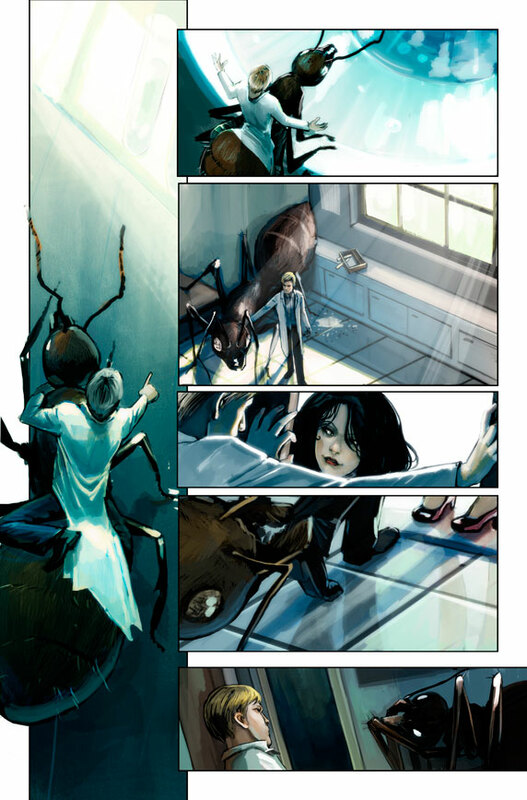 Her animal and insect work evokes David Petersen’s Mouse Guard work, and her depiction of Janet Van Dyne, the Wasp, is both realistic and unreal. In fact it is her creature drawings and work on Janet that counterbalances the lack of story and character development that Aguirre-Sacasa brings to Janet. 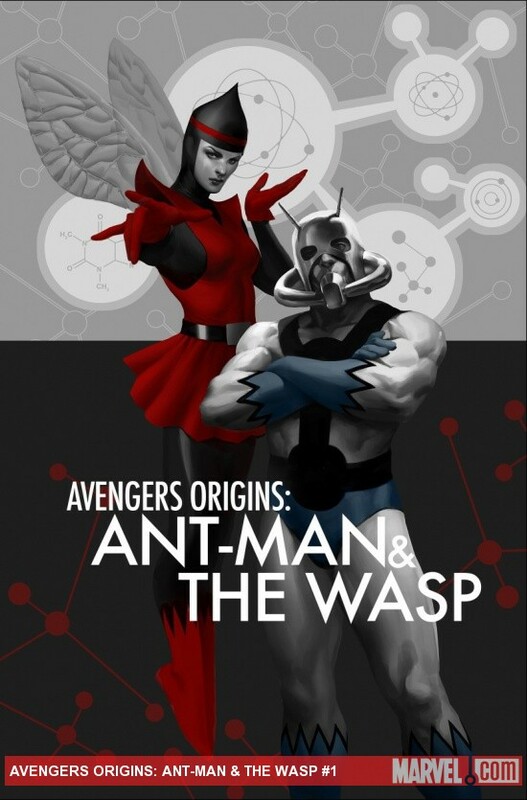 The story encompasses the back story of Dr. Henry Pym, seeking a grant to fund research into shrinking technologies after his wife is murdered, accidentally crosses paths with Janet Van Dyne, daughter of another scientist seeking grant money. Henry is stodgy and over-focused on his work, Janet is free-spirited. Their relationship slowly grows and doesn’t actually come together until literally the last panel. What is missing is chemistry…why she falls for him so quickly. But all this is forgivable for the brief page count, as the rest of the story is packed with action and interesting curiosities. 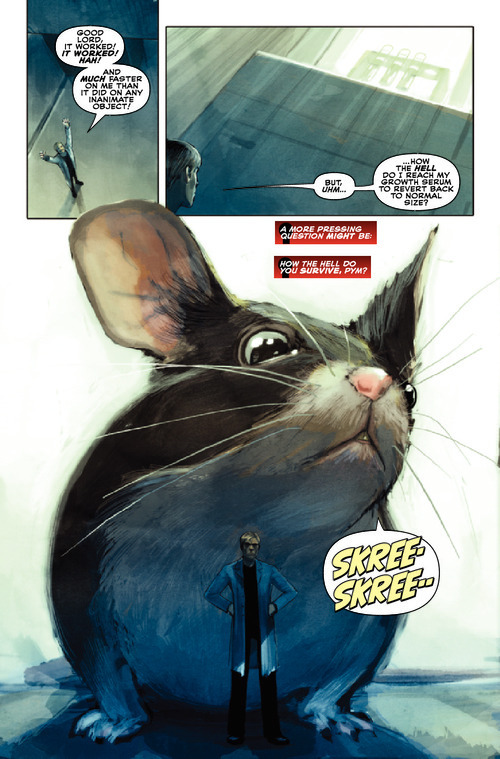 Pym’s story is straight out of the classic film The Incredible Shrinking Man, although Pym takes a surprising turn at immediately taking toward liking the insects he is confronted with, experiencing no fear of horse-sized ants, and instead bonding with them and working on problems together. That cornerstone of his character is nicely revealed. Van Dyne’s story becomes a hurried vengeance origin that forces the reader to remember the Stan Lee school of obtaining superpowers: Sometimes you just have to accept gamma rays for what they are, a quick mechanism to move you along to focus more on character and relationships. The how of becoming the Wasp is revealed so fast that you don’t really have time to scratch your head and question it. Ultimately Aguirre-Sacasa and Hans come together to create a really good looking book, and the cover Marko Djurdjevic is a real eye-grabber. If your only exposure to Ant-Man is the Robert Kirkman (Walking Dead), Phil Hester (Bionic Man, Green Arrow) and Ande Parks (Union Station, Green Arrow) The Irredeemable Ant-Man short-lived series, this issue is a good flashback to the original Ant-Man story, before the off-the-wall Eric O’Grady sneaked into Dr. Pym’s lab and got his own ant suit. If you haven’t read The Irredeemable Ant-Man , then there’s no time like the present to check out that funny series, also known for its great covers, showing the little hero actually was present in a previously released, character-packed, Frank Cho cover. And if you’re missing the other famous little superhero, the Ray Parker Atom character from DC Comics—who inexplicably doesn’t have his own series in the New 52—maybe someone at DC will get some inspiration from Hans’s drawings of a tiny guy in a big world to resurrect that character.